BEIJING — As the United States reverses its climate policies, the world's top greenhouse gas emitter is in the midst of setting up a national carbon-trading system. Chinese officials are preparing to launch an emissions market later this year that will cover roughly a quarter of the country's industrial CO2. Officials and nonprofit groups from the European Union, Australia and California have been advising the Chinese on their program design. Expectations are tempered: Details of China's national system are still murky, but enough information has emerged that observers are skeptical it will be immediately comparable to existing programs, due to design features as well as the haste with which China is rolling it out. "Initially, it's not going to be more robust than, say, California or RGGI or even some of the pilots," said Jeremy Schreifels, a visiting fellow at Resources for the Future who has been observing the market's evolution. He was referring to the Regional Greenhouse Gas Initiative covering nine Northeastern states. The National Development and Reform Commission, China's macroeconomic planning agency, has said it intends to start a nationwide market in November. But it's not clear what that exactly means — whether businesses will have to immediately start buying carbon allowances to cover their emissions, or some lesser form of regulation, like requiring companies to report their emissions. So far, observers say the market falls short of standards set by Western jurisdictions. Chinese officials have been working with counterparts in the European Union, Australia, Britain, Germany and Norway as well as California on the pilots, which began in 2013 in seven provinces and cities and vary in their design. Altogether, they cover around 2,000 businesses and 1.2 billion tons of CO2 annually, according to a 2015 paper by ZhongXiang Zhang, an economics professor at Fudan University in Shanghai. That's about one-eighth of the country's total annual CO2 emissions. The nationwide system would quadruple the existing programs' scope. "It'd be about four times larger in terms of the amount of CO2 emissions from the facilities that are [currently] covered, and it'd be by far the largest cap-and-trade system in the world," said Larry Goulder, an economist at Stanford University who has organized meetings of carbon market architects in both China and California. No carbon-trading system in the world has actually resulted in significant emissions reductions yet. Due to varying factors, initial emissions caps in the European Union, the U.S. Northeast and California all ended up comfortably above actual emissions, so businesses have not had to pay high prices or face significant incentives to curb their emissions. Rather, the programs have served as political consensus builders that have gotten industry accustomed to climate policies. China's program, which would dwarf all existing markets, will likely be similarly difficult to link to actual emissions reductions, at least at the outset. But it could inspire more jurisdictions to get on board. "There's really a lot riding on the success of the program," said Schreifels. "If China's CO2 trading program is perceived as a successful program, I think it could provide the other nations the confidence to adopt the emissions trading model and take on a climate commitment or a more stringent climate commitment. At the same time, if it's viewed as a failure, I think it could hamper climate policy in many parts of the world." International scrutiny, based partly on China's size and partly on other jurisdictions' familiarity with cap and trade, will provide an incentive to get it right, another academic expert said. "The last thing they want to do is to fail," said Angel Hsu, a professor at Yale-NUS College and Yale University's School of Forestry and Environmental Studies who has been studying China for the past decade. While President Trump is lambasting China on Twitter for its failure to rein in North Korea's nuclear threats, California Gov. Jerry Brown (D) has taken on the role of shadow climate envoy. He visited President Xi Jinping in June and called China "the hope" on climate change leadership. Brown cited China's interest when he signed a bill last month to extend California's cap-and-trade program through 2030. "China is copying this cap-and-trade plan," he said. California has been particularly involved in the province of Guangdong's pilot program, just north of Hong Kong. As such, it most closely mirrors California's; it started with a floor price of around $9 per ton in 2013. It is also the only one in China that began with the requirement for all participants to purchase some of their allowances, rather than receiving all of them for free. On the national level in China, California's role has been more limited. Cap and trade was not at the forefront of Brown's trip to China in June. In discussions with provincial and national officials, he focused more on development of low-carbon technologies like electric vehicle batteries. State officials acknowledge that details and frank talk are hard to come by in China. "There's never a full engagement with whoever is actually making the decision," Mary Nichols, the chairwoman of California's main air quality and climate agency, the Air Resources Board, said in an interview in Beijing in June. "I think it's mysterious even to people who've lived and worked here for a long time." Observers point out that the fundamental differences between China and Western countries result in different rulemaking processes and outcomes. While Western countries face political opposition from industry, environmentalists and other stakeholders, China's challenge is to introduce market-based incentives into a planned, top-down economy. "In China, it's not explicit political challenges that one faces as much as institutional," Goulder said. "That is to say, the country doesn't have as much of an apparatus for monitoring and keeping track of emissions. In addition, much of the economy is still not a market economy, but rather state-run in terms of the way prices are set, and that's particularly true of the power sector. One of the key challenges is how to introduce environmental regulations, even market-based regulations, in a world where many of the sectors won't respond as well because prices are controlled." Nichols envisions a significant back-end role on the national program, evaluating the market once it launches. "What gets results, what the actual cost of carbon control is how people behave under the program," Nichols said. "We're going to really get into the nitty-gritty of the whole thing." China's position on environmental policy, and climate in particular, has evolved slowly. "There's been a long process, over the past I would say 10 to 15 years, where China has migrated from a position where they initially saw the U.S.'s requests to have cooperation with China as efforts to derail China's development — to foist the burden of carbon emissions equally on China and the U.S., even though China's, historically and per capita, were way lower," said Orville Schell, a scholar of Chinese history and director of the Asia Society's Center on U.S.-China Relations. "This has much to do with NGOs [nongovernmental organizations], civil society organizations who were working with China over the last decade." Besides the effect of outside pressure, Chinese officials were also motivated to act on climate by internal criticism over the country's poor air quality. 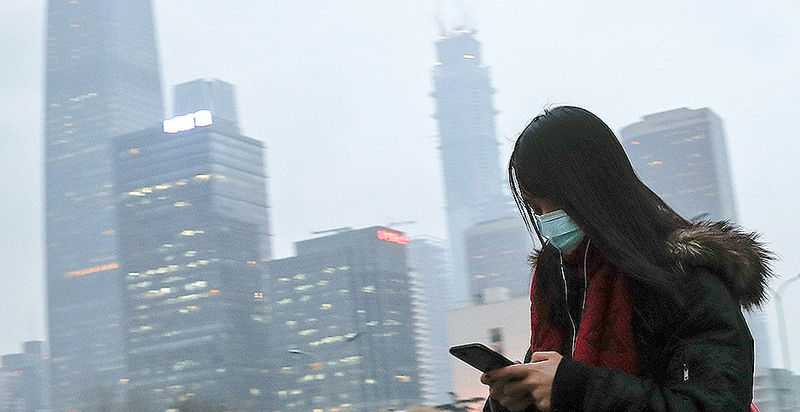 In 2012 and 2013, Chinese "netizens" realized that domestic air quality data were far rosier than international measurements showed — and that coal use was the main culprit. "I think that was really the tipping point," Hsu said. "I don't think it was international pressure or what the U.S. was doing; I think it was domestic pressure. It tipped the scales for President Xi Jinping to say, 'This can be a win-win for us.'" With a one-party, socialist-communist political system, once the decision was made at the top to embrace climate action, Chinese officials have been able to move fast since 2007, when the 11th five-year plan set first-ever energy consumption targets: a reduction of 20 percent energy use per unit of gross domestic product by 2012. China's National Development and Reform Commission launched seven regional trading programs in 2013 in a range of economic conditions, from industry-heavy Chongqing in the west to the urban hubs of Beijing and Shenzhen in the east. In 2015, Xi and President Obama signed an agreement under which China pledged to launch a national carbon-trading system by 2017, covering eight major industrial sectors. While China still expects to start the program this year, it now plans to cover only three sectors at the outset: electricity, aluminum and cement. That's due to a lack of good data on emissions and output from the rest of the sectors. The pilot programs will continue while the rest of the national program gets up and running. The truncated scope of the program isn't necessarily a major setback, experts say. "That's not anything unusual from a planning perspective," Hsu said. "China, in typical [former Chinese leader] Deng Xiaoping mode, likes to cross the river by feeling the stones first." Substantively, she said, the covered sectors pull their weight in terms of contributions to climate change: Cement is responsible for fully half of the country's CO2 emissions, and 85 percent of China's electricity generation is coal-fired. Concerns remain about the quality and opacity of China's emissions reporting data. The country has produced just two nationwide greenhouse gas inventories, covering 1994 and 2005, as Hsu pointed out in a paper. "It's fair to say that everything here is more opaque but is getting clearer as they begin to be willing to share more data, have their data be critiqued by others," ARB's Nichols said. "When first I started coming over here in 2008-2009, nobody believed any of their published data at all. Nobody thought they actually knew what was really being emitted, and in a fairly short number of years, we have moved to a point where I think people feel that there is a much better handle, much more willingness to divulge both what they know and what they don't know." In place of accurate emissions data, Hsu said that China has more control over businesses than democratic governments do, so it can more easily bring them in line and maintain environmental integrity if, for example, allowances are too plentiful and their price crashes, as happened in the E.U. 's system. "I think China will be able to have a better regulatory handle on some of these issues because they're not entirely a free market," Hsu said. "You have the stability and you have the infrastructure of the Chinese government having a huge amount of oversight over the market, so that could be good or bad." As in California, complementary measures, such as energy efficiency, have the potential to reduce emissions and make it appear as if the trading program is not responsible. China is also in the midst of introducing a "green certificate" program, similar to renewable portfolio standards in the United States. And on the planned-economy side, China has been encouraging a shift to lower-energy, higher-value manufacturing over heavy industry. Those policies could contribute just as much as emissions trading to China's internal economywide target of an 18 percent CO2 reduction by 2020 from 2015 levels. Due to a reduction in coal consumption and a lower overall growth rate, China's CO2 emissions fell last year, according to the International Energy Agency. And while China is still not committed to absolute emissions reductions in global climate negotiations, experts say its "intensity-based" U.N. carbon reduction targets, which are based on improving the relative efficiency of industrial processes, could be as effective as Western-style absolute cuts in emissions. "If heavy industry grows slower, a carbon rate or carbon intensity target could be even more stringent than a cap-and-trade program might be. If the economy grows faster than anticipated, it could be less stringent than a cap-and-trade program," Schreifels explained. "When there's a great deal of uncertainty, it may be better at addressing that uncertainty." Experts are watching for several upcoming indicators of the program's stringency, including whether it will be classed as a law or a regulation. A law would go through the National People's Congress and would have more authority than a regulation, which would be passed by the administrative State Council. But a law would take more time, possibly several years, to move through the legislative process. Transparency and integrity of emissions data are also important, as are the stringency of penalties for noncompliance. Without the backing of a law, the program might rely on informal, one-off punishments like making businesses ineligible to receive preferential loans or build new facilities. Schreifels estimated there's "probably an 80 percent chance it goes the regulatory route," at least at first. "Everyone needs to readjust their expectation on China's national carbon market," said Junjie Zhang, director of the Environmental Research Center at Duke Kunshan University, a joint venture of Duke University and China's Wuhan University. "It's time to change our expectation. I would say this would be the launching of the beginning of the beginning. Something is better than nothing."